I don't think it's any secret that I LOVE chocolates. So when Epiphany Chocolates offered to send me a sample of their new Holiday drink inspired flavors I was quite excited. These new flavors will be part of the "Get Cozy" collection. I was first introduced to Epiphany by way of my LuckyFABB Gift Bag and loved how decadent they were. 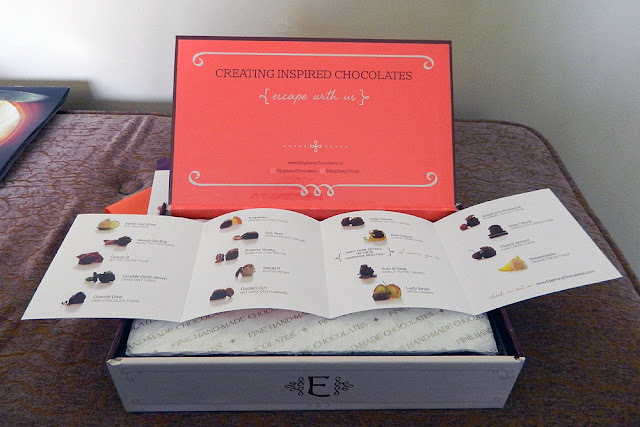 They create handmade chocolates inspired by creative flavors, audacious adventures and passionate people. Imagine handmade soft center nudges enrobed in chocolate with unique, surprising flavors and a signature keepsake box. Dreaming of an island getaway? Grab your swimsuit and sunnies...surfs up! A taste of cool Kahlua drenched in white chocolate and a little piece of macadamia nut heaven. You will be one tiki chic. Alo-ha! Naughty or nice this year? Either way, this is undeniably one hot toddy. Baby, it's cold outside so warm up with buttered rum enrobed in rich milk chocolate. Winter RX: Sip chocolate, it'll soothe body and soul. Beware: Visions of sugarplums may dance in your head with one taste of this cozy combo...pepperminty mocha covered in rich dark chocolate with candy cane crunch on top. You may just leap across the room to salute this sassy sergeant. 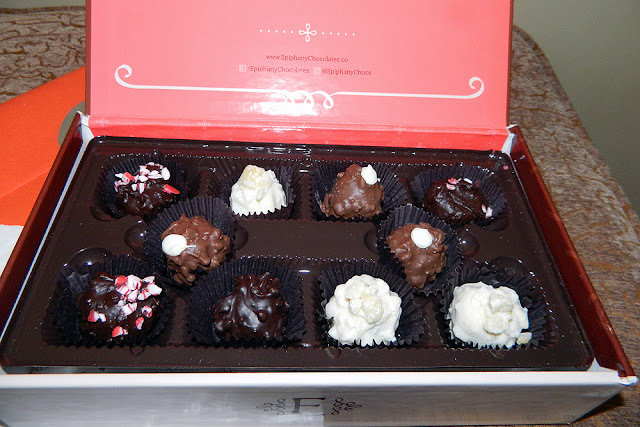 To share the holiday cheer, Epiphany Chocolates will be sending one of my readers an 18-Piece box of their "Get Cozy" collection with new holiday flavors! The giveaway is open to my readers in the United States AND Canada and will close on December 4th. Epiphany have also offered you 25% off an order from now until December 31st with code SPARKLE25! I am actually craving chocolates right now. Oh yum! Totally sign me up!!! Oooh what a festive giveaway! And of course I follow you (on google). Would love to take this with me to a holiday party! I follow on you google and want those chocolates in my belly now! Omg, I want to eat these chocolates right nowwwww! Cool giveaway and impressive blog! Seriously cool! :) I follow via GFC! Ephiphany chocolates are SOOSOSOSOSOS good! You know I LOVE my chocolate and I'm a follower! Yum! These sound absolutely delicious. Check out my giveaway above, I'd love for you to enter :)! Following them on Twitter as well. Following you on Bloglovin and GFC! I love good eating chocolates all :D kisses!! yummmm! I find people a bit suspicious if they don´t like chocolate or i mean who doesn´t like chcolate??? I Follow Closet Fashionista on Instagram.